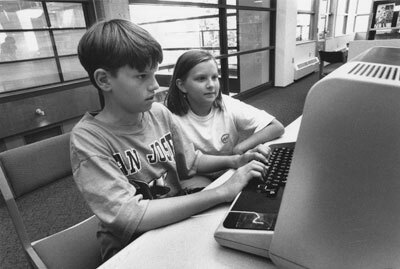 WVML Children's Department patrons, David and Laura Turpin, using the computer to look up a list of novels written by Stephen King. Scanned January 2012 using Epson Perfection V700 Photo at 300dpi and 100% of original image size. Alternate Versions: Lossless TIF from original scan at 300dpi and 100% of original print. W25.5 x H20.5 cm black & white print on photo paper.